I'm still a bit baffled how you paint. At first it seems a bit messy, and then suddenly it all comes together and looks brilliant! Watching your work unfold is endlessly entertaining. The wood is already fun. *dabdabdab* it's brown with green smudged on it. so I thought I would start a thread to talk some about how I paint, because it works pretty well for me and maybe what I've learned and practiced can help other people too. How I paint miniatures is grounded in how I paint paintings, so that's what I'm going to talk about here. 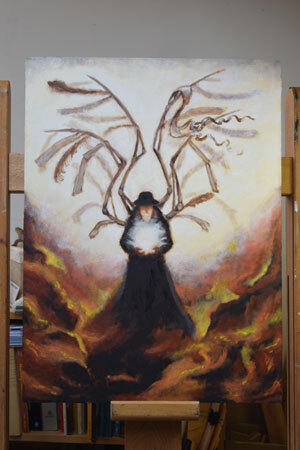 I have a series of WIP photos from a recent painting which I will use to demonstrate. I always paint on a well-prepared surface. 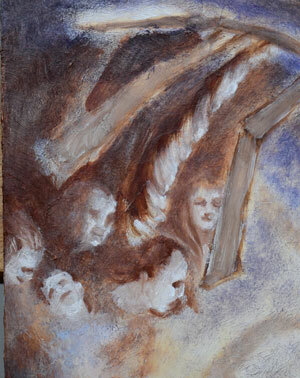 This is based on a classical technique in panel (or canvas) painting, where a white-primed panel (or canvas - I'm going to stop saying this now, but assume it is included as a classical painting support) is washed with what the Renaissance Italians referred to as a veil of color before starting the actual painting. 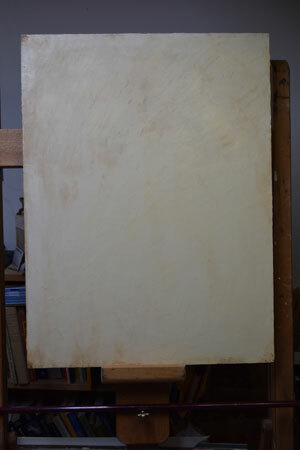 Here we have a masonite (not wood, as I said above) panel, 18 inches by 24, with a very thin veil of color on it. I primed this panel years ago and let it cure. 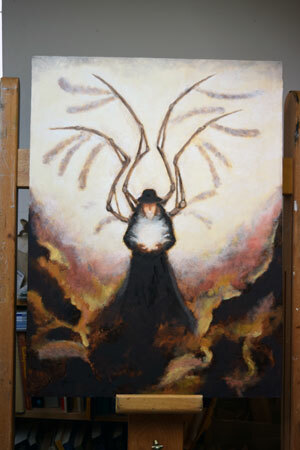 With oil paint, the longer the cure time the better. A masonite or wood panel is prepared by lightly sanding until it is a little rough, then painting with a warm solution of rabbitskin glue (exactly what it sounds like). This is allowed to dry for a full day, then painted with white oil paint. The best priming is Lead White in linseed oil; it is creamier and yellower than the stark white Titanium Dioxide, and linseed oil is mellower and yellower than the other, bluer oils sometimes used with white oil paints, but it is flexible, strong, and durable. Yes, this is lead paint. I laid it on in two layers, one brushed and then one smoothed with a palette knife. I refuse to sand lead paint to achieve a smooth texture, so this panel has a slightly stucco effect. 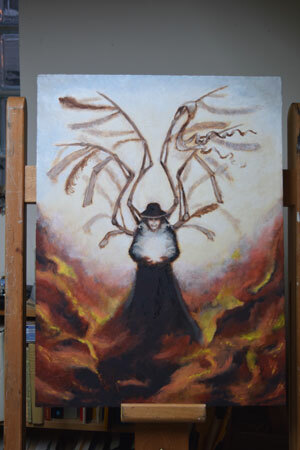 This has a very light veil of Burnt Umber oil paint laid on, then mostly wiped off. 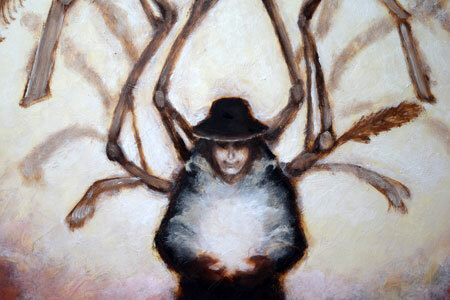 Sometimes I do a much darker veil (as I generally do on miniatures). 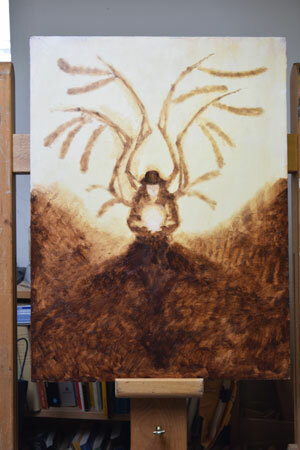 Burnt Umber is one of the naturally fastest drying oil paints, so I will be able to start painting the next day. And this is why I do not chafe at the prep needed for miniatures painting. 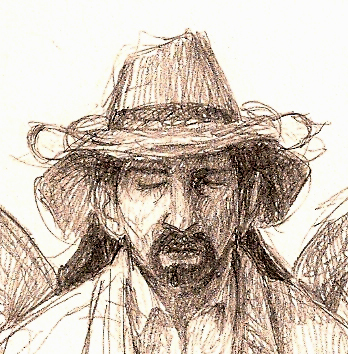 I had a little pencil scribble in my sketchbook that this painting was based on. 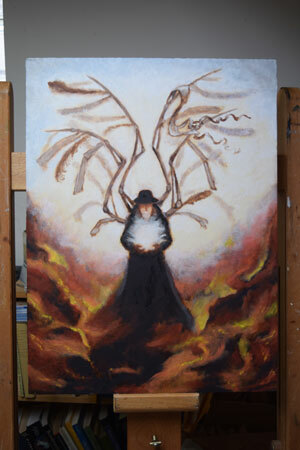 Sometimes my paintings are based on elaborate preparatory drawings, sometimes just improvised as I go. This one was a a little between. 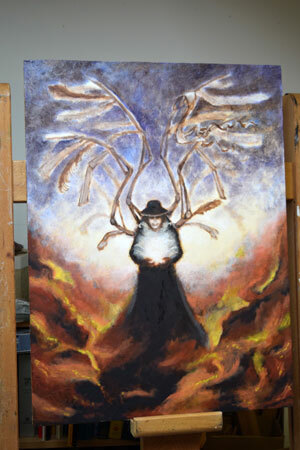 I generally do the first layers of the painting as a grisaille, which is to say a single-color image. Black and white is too stark, so I build up the image with Burnt Umber and a little Lead White. You may notice I am not using Titanium White. This is because Titanium White, although an intensely bright opaque stark white, is also a high oil absorber that makes for a greasy paint that dries very slowly to a slightly brittle film. 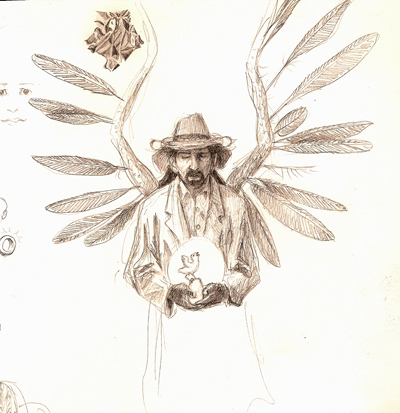 Pigments are idiosyncratic, and very different in how they act. Lead White, although more translucent and creamier in color than Titanium, is a low oil absorber that dries quickly to a strong, flexible film. I usually only use Titanium White in the brightest whites in the very last layers of an oil painting. This is one way that acrylic paints are simpler to use than oils, and partly why I find using them on miniatures so relaxing. Please note this is all still all the equivalent of the initial priming on miniatures. 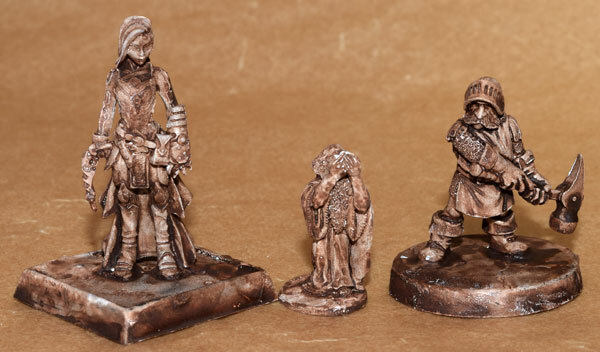 The sculpture on miniatures provides the "image" to work with, but in panel paintings the painter is doing all of the shaping work as well as the painting. Burnt Umber oil paint dries very quickly (idiosyncratic pigments ...), so I needed to paint the initial image in a single day. 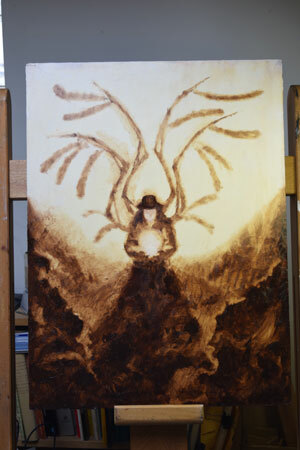 This is the initial sketch-in of the composition in Burnt Umber, with a little Lead White at the top. I am only using a small amount of white, as I have found that the intensity of the underpainting works best if it is in a single color with the ground showing through for whites. 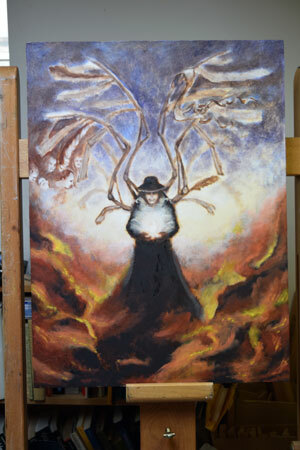 While the paint is still wet I add and move around and intensify the layers. Burnt Umber is a translucent pigment, so the thicker the layers the closer it gets to black. It will provide a rich tone under later layers. 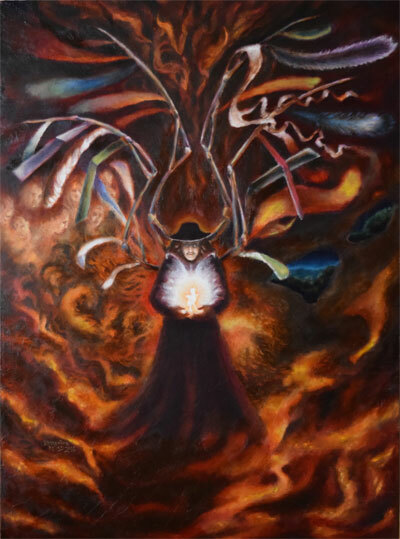 Here the virtues of oil paint show. Even a fast drier like Burnt Umber will stay wet for most of the first day. 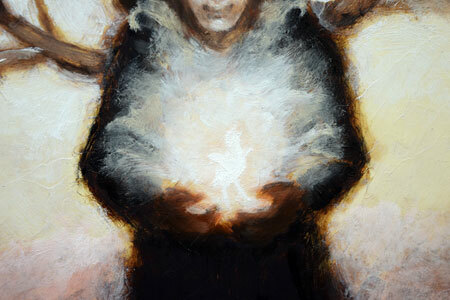 This lets me take away paint for increased luminosity (as in the "cloud" forms in the bottom half of the painting). Paint can be erased broadly with paper towels and pretty precisely with Q-Tips, wetted with a little paint thinner if necessary. This is a great way to control highlights (not so much on miniatures, where the cotton fibers tend to catch on the sculpt and stick). 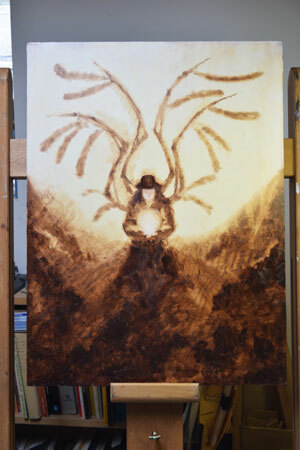 And this was the first day's painting, producing a tonal underpainting so that the lights and shadows will inform the final image. And that's a very cool painting btw! really cool stuff, thanks for sharing this. Good stuff, though! I'm still using store-bought acrylic gesso on cheap canvas, but I will probably start using better surfaces and prep now that I've got a few paintings under my belt (more or less). I will probably avoid lead white for the ground, because I do portraits I like a glass smooth surface to work on and yeah, I'm not going to be sanding lead, either. I have a few decent brushes but finally ordered a few nice brushes from Rosemary. 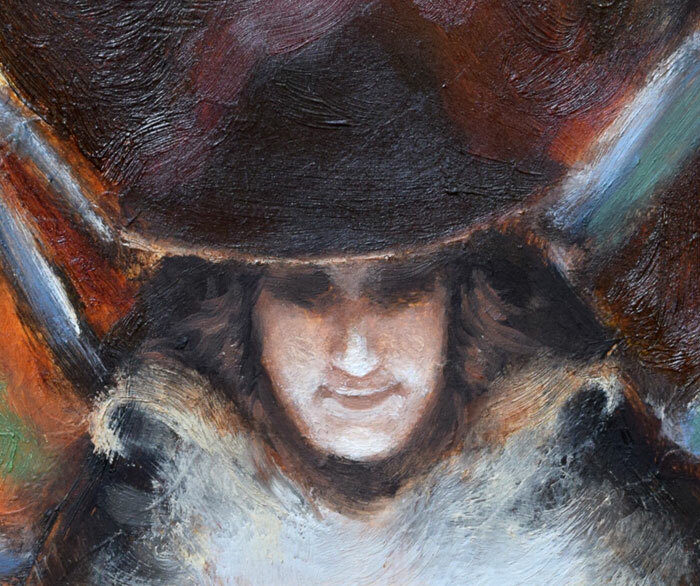 For anyone else reading this thread, CashWiley's signature above has a link to his portrait painting thread, which is also fantastic to read if you want to understand more of how traditional art comes together. I always love reading about art from both Pingo and Cash, tiny bits of their wisdom soak into my brain. 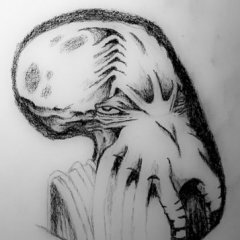 Thanks again to Pingo for writing so many detailed work in progress threads! Thank you. I enjoy my work and if something about it can help other people with theirs I'm all for it. I am very, very careful around my Lead White paint. It has some marvelous properties, but it's perfectly possible to paint just fine without it. I had not mentioned brushes. Almost everything here is painted with stiff hog's bristle brushes. FIne, soft brushes like the sables and kolinskys that we use for miniatures are too fragile for thick, gooshy oil paint, on the whole. I do use soft brushes for some kinds of blending. There is something called a fan brush which is used, dry, to pat very thin color mixes to blend them. It only works on quite thin paint films, though. My late M-I-L used to talk about casting your bread upon the waters. People do see these things. 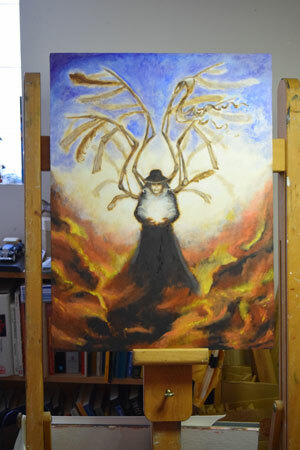 After letting the underpainting dry, I started laying in color. In oil painting there has been a rule of thumb for centuries: "Fat over lean." What this means is that high oil-absorbing pigments should not be laid under low oil-absorbers. It has to do with the integrity of the paint film, flexibility, cracking, and long-term survival of the painting. I've seen people describe this as slow driers over quick driers, but that's not actually the case. Drying oil chemistry is complex and the ways the oils interact with pigments are even more complex, so some very slow driers, such as the Cadmiums, are very low oil absorbers. So anyway, I started to lay in the first layers of color on the painting using cadmium pigments, with their rich reds, oranges, and golden yellows, blended with Lead White. 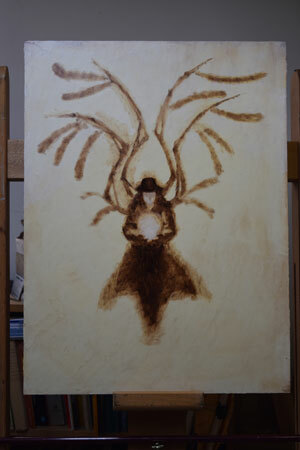 I worked out more of the winged-clawed structures using more Burnt Umber and Lead White. Ultramarine Blue is also a low oil absorber, good for early layers in a painting. I started adding some cool colors at the top. 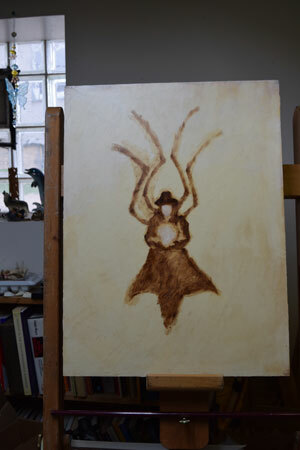 I began to work more on the details of the figure, continuing to use Burnt Umber and Lead White. Interesting angle on drying. I've been applying it to mediums but didn't think much about it with tube paint itself. the cads take forever to dry, I paint once a week in class and can usually just keep using my cads, all the earth pigments get refreshed on the palette each week. Also, I do use a soft brush quite a bit, the bristles add too much texture for anything but rough early painting. For mid-painting, I've been trying some mixed brushes, real and synthetic, that purport to be a blend of stiff and smooth. Not good enough for smooth work, but less textured and destructive than straight bristles. I may not always comment, but I do look at your thread. You're creating awesome stuff in there! I think it depends on how much paint one is laying down. If one is using a smoothly blended, academic style with many thin layers, a softer-haired brush makes sense. I was taught at a place with a vast collection of top quality French Impressionism, which tended very much towards the thick and gooshy in paint strokes. Many of my teachers seemed to be making conscious efforts to get us students to really get into the texture of the paints. I never liked the really thick paint, but I did love some of the lushness of Rembrandt's thick, thick white highlights and the liveliness of many of the Impressionists' works. I use hogs bristle brushes to get enough paint onto the board without collapsing the brush. I also like the presence of visible brushstrokes. Once the paint is laid down, I do sometimes use softer brushes for finer blends. Hang on a moment, let me see if I have a close up of the brushwork. So anyway. 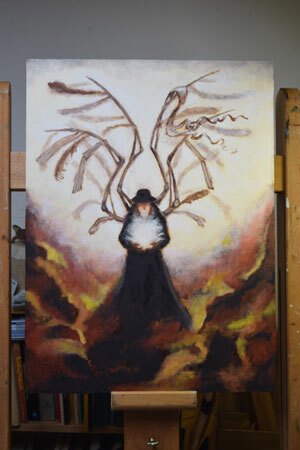 I still hadn't decided if I was going to make the space above and behind the figure light or dark, but I knew I wanted it to have coldish undertones. So I laid down some Ultramarine Blue, still sticking to the low-oil-absorption colors. Because of that low-oil-absorption colors thing, a lot of my oil paintings' first layers (after the umber underpainting) tend towards bright blues, oranges, and yellows, like this one. As a side note, I don't think I really added more yellow since the last photo. I think it's just the vagaries of lighting and cameras. I no longer remember what this color was. It is likely to be a dull violet mix, probably of Ultramarine Blue plus Burnt Umber or possibly one of the Violet Iron Oxides. I put some floating faces in on the left. These I did thinly, using softer brushes to blend. I am pretty sure this is a mix of Burnt Umber with a little Ultramarine Blue and highlights in Lead White. We go a bit thicker in the highlights, a bit thinner in the shadows; tricks for using light in the room when looking at the finished painting. Please see the main post here for rules, questions and general chatter, while using this thread to keep a list of links to your show-offs or show-off related comments in a single post: A reminder to please adhere to miniatures posting guidelines as usual. All the information you need should be here. As usual, the new format holds a "hard mode" challenge! March 8th is the birthday of Ralph H. Baer, often called the "father of video games." To tribute these early games - paint a character to resemble an early video game character (Think 16-bit era or sooner) the more obscure, the better! Addendum: It doesn't have to ONLY exist in that era. It doesn't matter if it's the only incarnation of it like Cosmo's Cosmic Adventure or Power Pete, or originated but is on 5183 of the series (looking at you, Final Fantasy.) but the spirit is to that era. Bringing back the classic for April, the "Fools' Brigade!" Paint a mini in a patently absurd scheme! CAV with a bullseye on it...elf with an "I'm organic" tabbard, etc. The more outlandish the better! As always, the game is made up and the points don't matter! Please use the full SKU and name of Reaper minis in the titles of your Show Off threads, per forum guidelines. You can find this information on the blister card or in the online store. I also like to give credit to the sculptor in a tag, so people can find their favorites. We have a high volume of posts generated from this challenge, which is great! But it's also creating a lot of work for the mods. Ladystorm has already urged folks to comply with these guidelines. 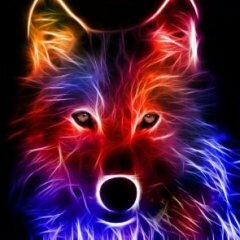 As an experiment, this project has been moved to be a bi-monthly challenge again, that seemed to have worked so until further notice that is our format. The longer time frame theoretically will give less stress to painting, and allow more complex jobs, and more sinister challenges. If going on vacation, can I paint a mini(s) ahead to cover that time frame? - Yes. Are speed paints acceptable - Yes. Can it be a mini started previously? - Yes. Based or unbased? - Yes. Do minis for exchanges count? - Yes. Due to the variable nature of a CAV I compare them against a generic 28mm figure and the Avatar large figure. I take height and bulk into considering if it is worth 1 or 2 figures. If you have a question on the size, please post it here, and I'll address them individually. Much like last year, the idea is to help those of us that normally paint VERY little or not as much as one would like, to start painting more. Shelf of shame minis from ages long forgotten! Again, I request that when tagging your posts, please use "RPChallenge" to help with locating minis from this. This is Stonehaven's Half-Orc Librarian, a pleasantly sinister and unassuming character. The quote in the title of the thread is from Neil Gaiman. Comments et alia welcome, natch. WIP thread here. This is Stonehaven's Half-Orc Nobleman, another nice and eccentric steampunk character. The quote in the title of the thread is from Beau Brummell. Comments, etc. welcome. WIP thread here.